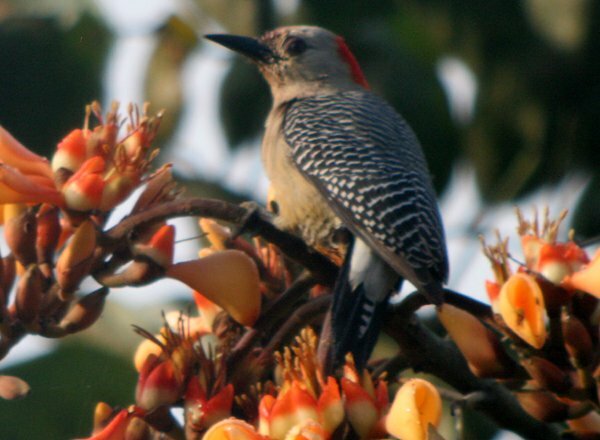 On a recent trip down memory lane in the form of searching through old photos from my trip to Honduras I serendipitously stumbled upon a series of shots of a woodpecker feeding from flower blossoms in a tree. I was relatively certain that the bird was a Golden-fronted Woodpecker Melanerpes aurifrons but, time and memory being what they are I figured a quick search online to make sure couldn’t hurt. I was somewhat surprised to see that the images that came up when I searched for Golden-fronted Woodpecker were different from my bird, most noticeably in that my pictures showed a bird with red on the back of its head while all the pictures from the search showed yellow in that place. What the heck? Could I have completely misremembered the bird that I saw two years ago? Flipping from the field guide plates to the species accounts muddied the water for me a bit, as instead of a discussion of subspecies there is a discussion of three different groups, which have names that overlap with the subspecies’ names. It seems that the bird photographed here is part of the Polygrammus group, though I thought for awhile that it might be part of the Dubius group and I am still not one hundred percent sure either way. Let me tell you, after looking at Howell and Webb I was thinking that Dubius was the perfect group for me and I could forget about the darned woodpecker. Text like “Complex geographic variation” and “variably intermediate populations” did not help me one bit. Then I remembered that I had Woodpeckers: An Identification Guide to the Woodpeckers of the World sitting on my bookshelf and decided to see what Winkler, Christie, and Nurney had to say about Golden-fronted Woodpeckers and its various and sundry subspecies. I was initially excited to discover a head shot of a female santacruzi that matched my photos to some degree, but not entirely, and then quickly dismayed to see an illustration of a santacruzi tail that did not match my bird at all. My dismay was allayed to some degree when I found text describing santacruzi as having “rather variable” plumage and information that there are many intergrades with other subspecies documented. Of course, this put me back at square one, relatively unsure as to what subspecies the bird pictured here belongs to, though it seems that by range alone santacruzi is the best bet. What have I learned from all of this? I’ve learned that as difficult as it is to figure out things like exactly what species a bird is can be when the taxonomy is not settled it is even more difficult to nail a bird to subspecies when the species has a large range and a lot of mixing. I also learned (again) that the answers one seeks are often not really findable, at least not without expert help. So, help! If you know more than me about this woodpecker please leave a comment and help me figure out what the heck this bird is! 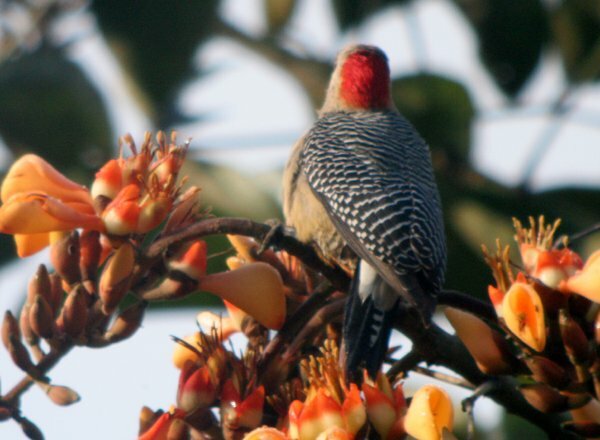 *Though Howell and Webb do not follow the AOU in merging the Centurus woodpeckers into Melanerpes so they actually call it Centurus aurifrons santacruzi. How fun is taxonomy? Hi Corey, I do not have an answer to your question but just want to thank you for this article as I am down in the Yucatán (only two guidebooks with me) and I just spent about an hour going through the same ID confusion you describe above. 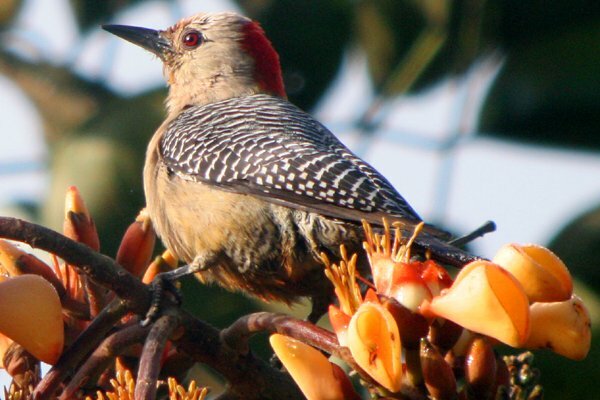 “My” subspecies of golden-fronted wood-pecker, which comes to my patio every morning, has clearly red (no yellow) on the nape, the nasal tufts and the wash of the belly. identify.whatbird.com clued me into existing differences in “the color of the nape, nasal tufts and belly” which helped me to then find your article by searching subspecies. Isn’t this fun?! !